What are the dimensions of these? We have small white paper towel dispensers but kids still put the non flushable ones in the toilet! The dimensions for these hand towels are 23cm x 30.5 cm. For the most economic and practical option within your workplace, choose these Flushable C Fold Luxury Hand Towels White. Offering a luxurious feel with their embossed texture, these 2 ply tissues are soft to the touch which effectively absorbing up liquid and moisture in seconds. Designed to flush easily down the toilet, these hand towels are produced in an Ecolabel certified factory and have been folded in a 'C' design to coordinate with specific dispensers. In this pack, over 2430 tissues are folded together making this an economical choice for high-traffic environments and will reduce the amount of time spent at replenishment. 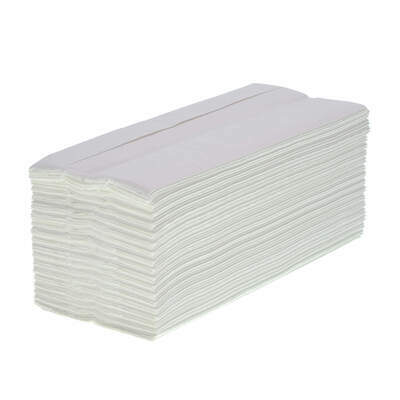 These durable tissues are compatible with our r Paper Towel Dispenser C V Fold Bright White. We also stock a wide range of alternative Paper Towels in C, V and Z Fold.